The custom Salesforce.com solution will be the first CRM system for the Company to support their new product. 360 Vantage®, a leader in cloud-based sales and marketing technology solutions for Life Sciences, announced today an agreement with a specialty pharmaceutical company focused on cancer therapies for its 360 CRM™ solution built on Salesforce.com. 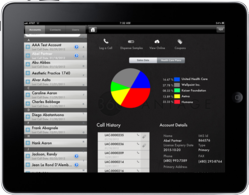 The custom Salesforce.com solution, which uses the Apple® iPad®, will be the first CRM system for the Company and will be used by their specialty sales reps to support the Company’s first new product. 360 Vantage was selected based on their Salesforce.com, mobile and industry domain expertise, as well as their ability to meet an aggressive timeline based on the Company’s immediate product launch. Delivered as a cloud-based service, the 360 CRM solution will give the specialty sales force access to accurate, real-time customer data, market intelligence and reporting through an intuitive interface. The flexible system also provides the Company with a platform that can evolve as the Company’s business requirements change and as their product lines expand.